This guide goes someway to explain suitable radio products used to communicate at sea. It is not intended to replace guidance from professional radio specialists such as RYA appointed instructors.This is general information about the different types of marine radio products available and will hopefully help you make an informed choice when purchasing. 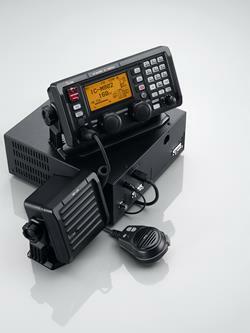 The most popular way of communicating at sea is via a marine VHF (Very High Frequency) set. These are combined transmitter/receivers that operate on allocated frequencies known as ‘channels’. Marine VHF radios are used for a variety of purposes including; contacting harbours, marinas, locks, summoning the rescue services and ship-to-shore or ship-to-ship communication. To prevent maritime transmissions creating interference with other radio users, a section of the radio spectrum has been allocated specifically for marine communications. To make operation within the spectrum as simple as possible, radio frequencies have been organised into numbered channels (eg. Ch.16 actually refers to156.800MHz).The VHF marine radio band remains consistent around the world, ensuring that vessels travelling on international voyages can always communicate. There are 55 international marine channels, a similar number of private channels (allocated on a local basis to commercial organisations), and some unique national channels. Channel 16 (156.800MHz) is the international calling and distress channel. Handheld VHF radios work in exactly the same way as their fixed equivalents. Many of the features are shared and in ICOM's range they even follow the same operating protocol, to help users who use both types. As with any tool there are advantages and disadvantages. Handheld advantages include small size and portability, usefulness in an emergency, should a vessels electrical power fail, independence from the vessel's power and antenna, and value. Disadvantages are related to the power output and battery life, which affects range and how long the handheld can be used. To summaries, compact size makes handhelds more suitable for small vessels without their own battery source; or as emergency back-up for fixed radios or as additional radios for crew and use in tenders etc. All ICOM fixed-mount marine VHF radios have DSC calling capability, allowing you to alert other boats, ships and shore stations with the single press of a button. These DSC capabilities include; position polling, a variety of group calling options and the ability to connect to a remote microphone and act as an inter-ship intercom system. Many radios also have automated fog horns that connect to an external hailer horn to act as a public address system and built-in hailers . Fixed radios do require installation, including connection to a power source, VHF antenna and GPS antenna. When siting your radio, you should think about how it will be used. You will probably need it whilst navigating and at the helm when entering or leaving port. Think carefully before installing. Many customers ask about the range (distance) over which a radio can communicate. It is the most popular question, with the hardest answer. Radio travels as waves… similar to light, and like light it can be reflected, reduced or even stopped by other objects. A popular answer is 'line of sight’ which essentially means 'if you can see it, you can talk to it'. This is generally a good guide. You must remember that the radio signal comes from the radio aerial (not the radio itself) and therefore mounting the antenna higher allows the radio to 'see' further. The same rules apply for receiving a signal, although some base station aerials are also mounted on very high masts. This is another influencing factor. As a stronger, more powerful light can be seen from further away, the same applies to radio. Radio power is measured in watts and the higher the power the further the range, but it's not quite that simple. Even very low power can give some range, subject to conditions. Power can be used to improve the quality of signal and to overcome some obstacles. Remember, more power out means more power in, giving shorter battery life for handhelds or non-recharging batteries. Always start with the lowest power setting and work up. All fixed sets have at least two power settings, 5 watt and 25 watt. Handhelds have various power levels, ICOM models are typically 1 watt to 6 watt as standard, with 1~5 watts available on entry models. Because VHF travels in straight lines, like light, as you travel away from land the curvature of the earth prevents the signal from reaching you. This happens between 35 and 50 miles off shore and if you still need to communicate over that distance you need to look for some other way of achieving this, ie., by using HF (SSB) radio. Longer distance (beyond VHF) communications are achieved using an MF/HF/SSB radio. MF means Medium Frequency and gives a range of up to 200~250 miles. HF or High Frequency extends that range to thousands of miles and maybe even global. SSB means Single Side-Band and is the mode that the radios use to communicate. This subject can quickly become very technical and we will not dwell on the whys and wherefores here. Many books exist for those who want to know more. As HF relies on propagation to achieve long range, it is essential that the signal is given the best possible start. This generally means that the antenna and RF ground need to be correctly installed. Whilst an ATU will improve antenna operation, the RF ground and power supply are more complex and require a degree of technical knowledge and experience. For this reason we advise customers to seek professional advice on HF installations. It is worth noting that this equipment may be used in a safety of life situation and cutting corners to save a few pounds is really not worth the risk. MF/HF/SSB equipment draws a high current (around 30 Amps at 12 Volts) and when incorrectly installed, transmitting can affect other instruments such as GPS, autopilots etc. All radios require the user and the vessel to hold a relevant licence. The vessel's licence is like a car tax disc, but is also the key to obtaining an MMSI number, which will uniquely identify your vessel. The user requires a radio 'driving licence' and two different types are available. 1. For VHF only, the SRC (Short Range Certificate) takes one days training and essentially instructs users in radio etiquette and procedures. VHF operation itself is fairly straightforward, however, the the course also teaches you about digital selective calling (DSC) functions and emergency procedures. 2. For other communications (HF, Satcom etc.) the LRC (Long-Range Certificate) is required. This covers procedures such as setting up an HF call etc. and takes about 3 or 4 days. Courses are available nationwide at RYA registered schools. 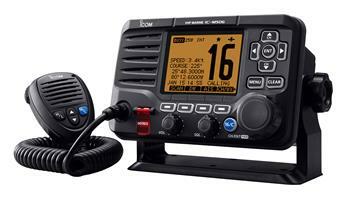 We hope this short guide has thrown some light on the topic of marine radio.